SEAPORT CARGO ACTIVITY ACCOUNTS FOR 26 PERCENT OF THE US ECONOMY: Ports generate $4.6 trillion a year in economic activity and support 23 million American jobs. The funding levels in spending bill will benefit US ports. The federal government is a key partner with US ports and their private sector partners. The 2017 Omnibus Appropriations Bill will better enable seaports to meet the growing demand for the movement of freight. The American Association of Port Authorities (AAPA) is applauding Congress for approving the 2017 Omnibus Appropriations Bill, which will maintain or increase funding for several programs in a variety of federal agencies that help America’s seaports deliver economic prosperity, create US jobs and benefit local communities. President Donald Trump signed the measure yesterday after it was passed by the United States Senate. The House of Representatives approved the legislation on Wednesday. The legislation is an important milestone in AAPA’s America: Keep It Moving campaign, which informs policymakers, and those who influence policy, about the job-creating power of US ports. 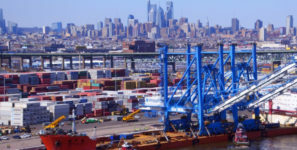 The nation’s manufacturers, farmers and other workers count on modern and efficient seaports to move American products to vital overseas markets. $1.466 billion for the Food for Peace program, with a one-time $134 million increase for famine crises and $202 million for the McGovern-Dole program for the remainder of FY 2017.